Datsun GO, which was revealed for the first time in Gurgaon on 15th July 2013 at Kingdom of Dreams is spied testing here in Chennai. 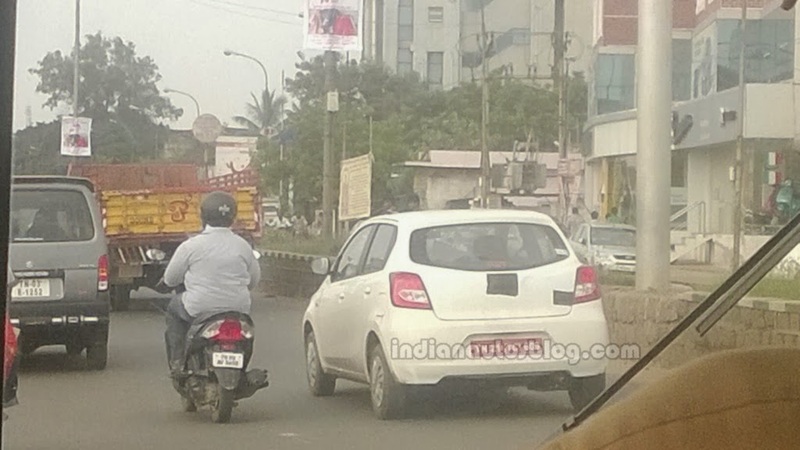 The white colored small car for which "Datsun" and "GO" logo on the bootlid were hidden for some reason is scheduled for a launch here in India during January 2014. Based on the Nissan Micra’s ‘V’ platform, the Go will be powered by the same 1.2-liter three-cylinder engine powering the Micra, though Nissan engineers will be tuning it to optimize economy. While the specifications of the engine were not revealed, we expect the ARAI to rate it in the region of 20km/l (given that the Micra Active delivers 19.49km/l). The Datsun's GO will be manufactured at Renault Nissan's Chennai facility and will also be exported to other countries including Indonesia, South Africa and Russia apart from being sold in India. The company has promised a starting price below INR 4 lakhs, thus putting it in the league of the Maruti Wagon R, Hyundai i10, Chevrolet Spark and not to mention, its very own Micra Active. The company has aggressively targeted to sell 100,000 cars during the first year and later increase it to 250,000 cars per annum while it starts getting exported.